You’ve seen them before. Well, you’ve seen them keeping the leftovers fresh. This time… they will be serving a much bigger purpose than preserving your leftover pizza. This guide will walk you through tupperdors and how they just very well may be the best thing for your cigar collection right now, especially if you are newer to cigars and haven’t had a chance to hoard them yet. 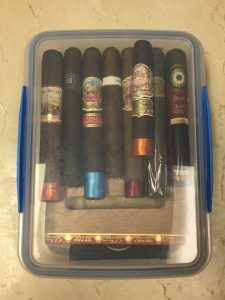 I bought my first tupperdor whenever my desktop humidor started leaking and I never turned back. 1 What Is a Tupperdor? 5 What Else Do I Need For a Tupperdor? So why are tupperdors so great? Tupperdors are relatively cheap. If you are new to cigars and you just want something to help preserve that surprise mixed sampler you just pulled the trigger on from SmallBatchCigar then this could be the perfect solution for you. Tupperdors are versatile. They can vastly range in size to accommodate just a few cigars all the way to hundreds of cigars. Of course, you can get a tupperdor the size of a napkin or you can get one the size of a foot stool. It all depends on how many cigars you plan on having! Tupperdors are very transportable. Unlike a desktop humidor or a wineador, you can find a size that you can take anywhere and as long as the temperature is within the 60 – 70 degrees range, you are good to go. This makes tupperdors perfect to store in your office desk or cabinet. You don’t have to season tupperdors. Since they are airtight and plastic, there’s no preparation process. Tupperdors only require a small bit of cedar vs. humidors that have a cedar interior. Tupperdors aren’t the prettiest humidors that you can purchase. For those of you who care more about function over form then this may be a great fit for you. However, there’s always the option of sprucing them up with a little elbow grease or a couple stickers for the lazy ones out there. You have to open them up every 2-3 weeks and let your cigars air out for a few minutes. 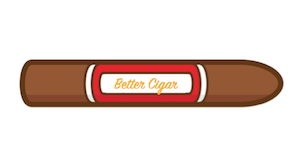 As we’ve talked about on BetterCigar, cigars need air circulation so there’s a bit of maintenance with tupperdors so that your cigars don’t dry out. For some of the same reasons, it’s also a good idea to rotate your cigars at least once a month or so. For example, if you have a couple different layers of cigars (which is certainly okay) then you will want to take your cigars that are on the bottom layer and put them on the top and vice versa. This is mainly due to the fact that your humidifier is likely going to be located in the same place inside of your container and so you want all of your cigars to have access to the sweet, sweet moisture that keeps cigars fresh. Now that we’ve looked at it from both sides, the question is, how do you pick the right tupperdor? The most important thing about picking a tupperdor is making sure that it is airtight. This may go without saying but many times tupperware containers, especially cheap ones online, aren’t completely airtight. Sometimes manufacturers don’t specify that in the specifications so tread carefully! Never assume a tupperware container is airtight or you could learn the hard way. Although tupperdors are cheap, there is a certain degree of “you get what you pay for” here. 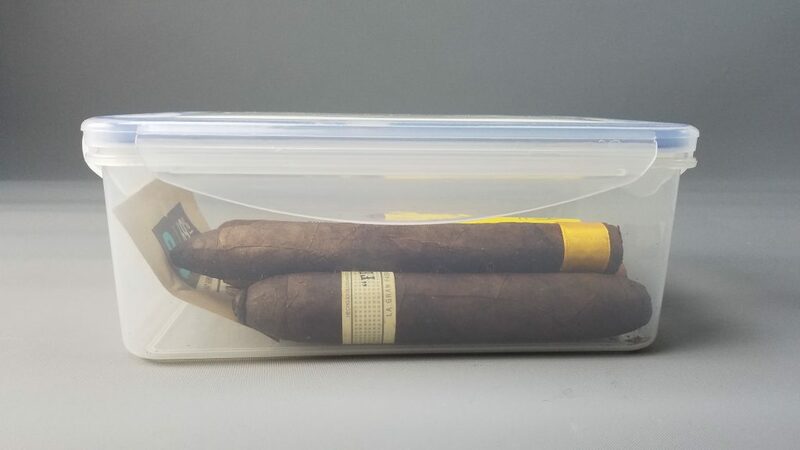 Other than the requirement of being airtight, it’s also helpful if your tupperdor has a handle or grips for you to be able to transport it easily, especially for a larger container. Cigars are very delicate so being able to handle your tupperdor easily is a big plus. You don’t want too much shifting around in there or you may risk damaging your cigar wrappers. It’s important to have a clear container so that you can keep an eye on your cigars. It’s always nice to be able to check in on your humidity reading without having to open it up. Clear is a great choice unless of course, you store your cigars within sight of direct sunlight. Lastly, we would strongly recommend making sure that your container is BPA-free. Most food containers are BPA-free but be careful if you are grabbing a container that’s laying around the house. You certainly don’t want harmful chemicals potentially seeping into your tobacco. What Else Do I Need For a Tupperdor? Cedar – Cedar wood is important because it helps keep moisture in check and your cigars can age appropriately. You can go with sheets of cedar to preserve space or you can go with trays to help organization and enhance the aesthetics of your humidor. You don’t need much here. Humidification – Cigars need moisture to help keep all those delicious flavors fresh. You will need a two-way humidification solution that is going to basically keep your humidity from getting too high or too low. We recommend Boveda packs or a Xikar jar. The bigger the tupperdor, the more of each of these products you will need. It’s always best to order more because you will use them eventually. Generally I like to have 1 Boveda pack per 50 cigars. Additionally, I recommend aiming a bit lower in terms of humidity for the Boveda packs since tupperdors don’t breathe as well. For example, go for a 62% Boveda if you would like your tupperdor in the 65 – 67% humidity range. Hygrometer – When storing cigars, it’s important to have a pulse on the humidity in your humidor. We always recommend going digital and this is no different. It’s best to pick a hygrometer that has adhesive so it doesn’t take up too much real estate in your tupperdor. Be sure to calibrate your digital hygrometer first to make sure you are getting the right humidity reading. We recommend the Caliber IV from Western Humidor for a reliable digital hygrometer option. If you don’t trust some of the tupperware containers you have laying around, here are some great picks. After all, you don’t want your cigars smelling like Monday’s dinner, do ya? 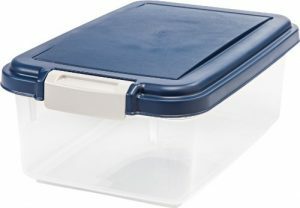 Tightvac Vacuum Sealed Storage Container: Have a smaller collection or just getting going? Although not exactly a tupperdor, this might be the right cigar storage solution for you. Think of it as about the size of a Gatorade bottle. Just make sure to leave room for a Boveda pack. The only problem? You will outgrow it quickly! 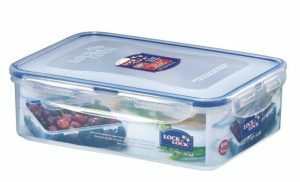 Lock & Lock Rectangular Storage Container: Lock & Lock makes some heavy duty top notch plastic containers. They are a few dollars more expensive than the IRIS below but those extra few dollars buy you a much sturdier seal. This container has clasps all the way around instead of just the end. 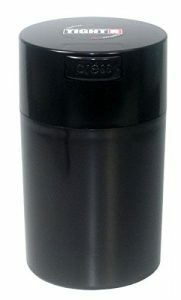 IRIS Airtight Food Storage Container: This is a great bang for your buck option that will allow you to get your hands on a larger tupperdor on the cheap. It all has the right benefits with a nice clasp. 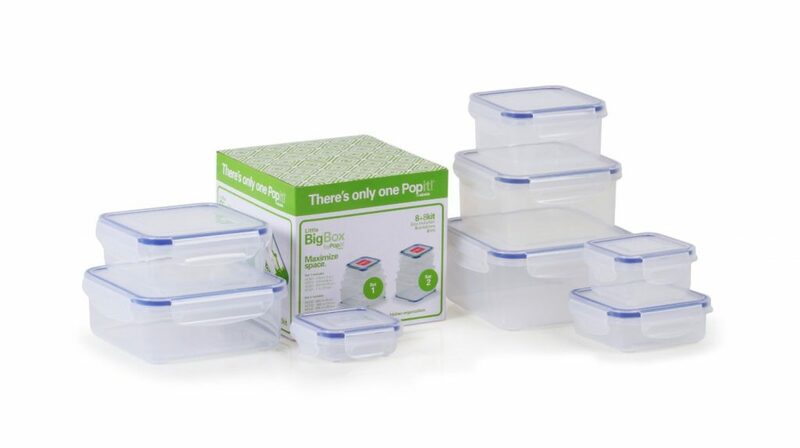 Popit Little Big Box Set: Can’t decide what size you need? We are of the opinion that you can never have too many plastic containers laying around, especially if you are a neat freak. Buy this set and you can have multiple tupperdors for every location or better yet, give them away as gifts with a few sticks. That’s pretty much wraps it up for our tupperdor guide. 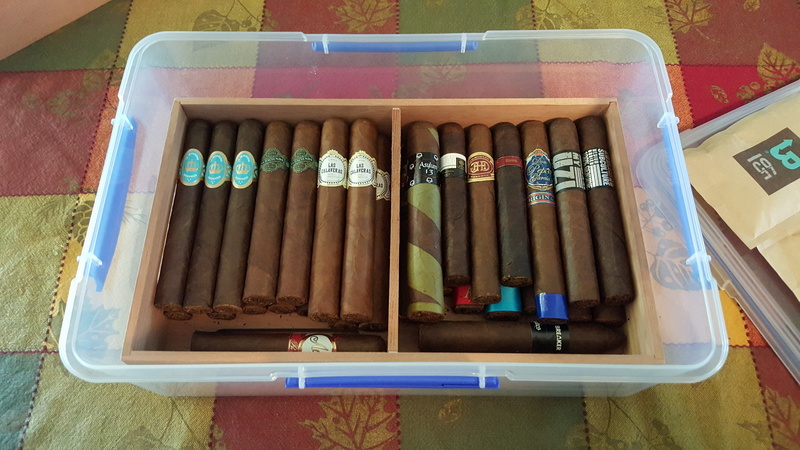 As a tupperdor owner myself, I’m happy I made the leap until my collection grows large enough to warrant a larger humidor. Please let us know if you found any other useful tips or tricks of the trade for these cheap and easy cigar humidors. If you selected one of the tupperdors above, and need to a little more help figuring out how to setup, check out the video below for a straightforward explanation from the Humidorks.